When I saw this headline, I was rather surprised, it seems to be just new Philip Morris stickers though. Just? I seem to recall tobacco advertising is banned. I'm even more surprised the article speaks of "title sponsor", yet on the F1.com page I don't see any such title. Only recently, I was reminded about their subliminal advertising, when I noticed what is now on the drivers' gloves and overalls. This certainly is worth following closely! 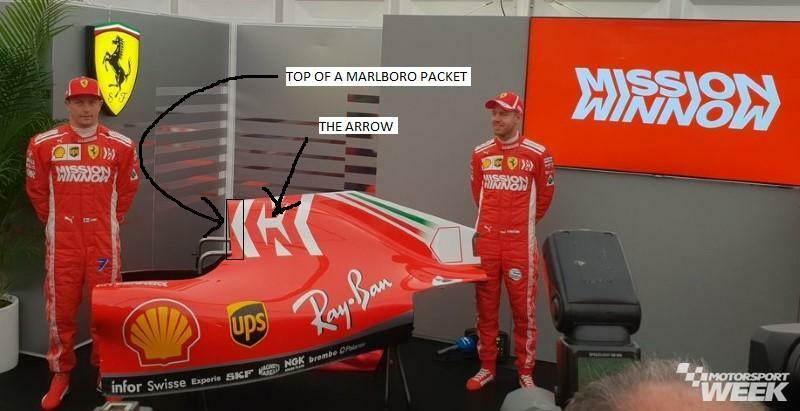 At least the arrow points to their best driver! Still very surprised about advertising for smoking. And perhaps even more about the fact they never stopped as title sponsor. I'd suggest it's a means by which to put two 'M's on the car. a new global initiative to create engagement around the role of science, technology and innovation as a powerful force for good in any industry. The global initiative takes to the tracks this week at the Formula 1 2018 Honda Japanese Grand Prix at Suzuka. So in other words, it's empty marketing gobbledygook designed to give Marlboro a legal screen to put their advertising on the car? Strange, I may remember this incorrectly, but the last time I asked whether the logo Ferrari and Ducati were displaying, was in reality subliminal advertising, I thought the feeling was that I was seeing ghosts. Now I wouldn't be surprised if the disappearance of the logo was really preparation for this. Vaping is hardly new, after all. “Through Mission Winnow we want to let the world know how we have changed, to share our pride in the transformation that the people of PMI have achieved, as well as our dedication to rigorous science and innovation that can lead to a better future,” says André Calantzopoulos, chief executive of Philip Morris International. Yeah right. When Philip Morris ceases promoting its cigarettes to young people in developing countries I might sit up and listen to Mr Calantzopoulos's fine words. The Mission Winnow website looks like a tobacco version of Scientology. It has nothing to do with advertising Marlboro. It's simply a coincidence that the big logo on the engine cover is a big red and white arrow made up of a mirrored M and the 'Mission Winnow' logo on the drivers overall contains six arrows. Ok, I'll be honest, I do not see it. When I look at the logo it does not remind me of Marlborough at all. What am I missing? I just don't see it! Anyway, I am not a smoker so I don't even know when was the last time I saw a Marlborough pack. Rearranging the deck chairs on the Titanic!!! The new livery looks so odd to me with all that white littered everywhere. For the dyslexic, the logo could be read Mission Minnow. Which could be appropriate, but I digress. If I had any interest in it, I would Google search to find out what "Mission Winnow" meant. But I don't. My dad smoked 5 packs of unfiltered cancer sticks a day before quitting. He died 30 years later from a latent cancer... caused by smoking. Since the early 1980s, I've given my financial advisor specific instructions not to purchase any investment in tobacco companies. I sleep better. At the time when OVERT tobacco liveries were banned (season end 2006), some thought it could spell the end of F1. But just like Big Tobacco's insidious need to lace it's products with hundreds of addictive/harmful chemicals. the cancer stick companies have maintained a surrepticious presence... now with stealthy advertising. Oh well. Time for the EU to ban the product from any involvement whatsoever. Like that will happen. Unpopular opinion, but everyone - not just the EU - should ban them outright, not just the advertising. They're a menace to society, and contribute absolutely nothing but money in the pockets of certain corporations. To be clear, I meant cancer sticks should be banned from INVOLVEMENT in motorsport, not necessarily from society in general. My problem is America's problem. I live in Michigan. I am with Saio7... I just don't see it. What is next, banning tbe use of red and white colors? Until you see the number deaths by DUI every year... These are in the thousands. I remember that it was whispered at the time the reason that the smoking ban started in the UK wasn't because they were concerned with people's health: it was because of the amount of money it cost the NHS to treat them. So it hasn't got to do with morals, the government didn't suddenly grow a consciousness, just down to money issues. The fact that they stop smokers harming others (and our noses!) is an added bonus. Not sure I agree with this entirely, but it makes sense. Can of worms indeed! If you look at smoke related deaths or illnesses/ injuries, at a guess i'd wager most tobacco related deaths and diseases affect the smoker alone. Not all, but an overwhelming majority. A small minority affect non-smokers. If you consider alcohol related deaths, illnesses or injuries, a fair percentage would be of those who were not the actual consumer. Consider road deaths due to DUI's, domestic violence instances, public brawls, some resulting in death, alcohol related deaths by drownings and other misadventure. This would indicate to me that alcohol could reasonably be considered a more socially insidious product when it comes to deaths than ciggies and a bigger burdon on the public purse as well. The only reason they won't ban tobacco is the same reason why prohibition didn't work in the States in the early 1900's. It's all to do with money and black market tobacco. Governments are just as addicted to darbs & grog sadly as much as some of the general population are. Globally, more than a third of all people are regularly exposed to the harmful effects of smoke. This exposure is responsible for about 600,000 deaths per year, and about 1% of the global burden of disease worldwide. This risk factor is prevalent in practically every region of the world. Generally, it's harder to quantify the impact of "secondary drinking," if that's even the right term, but the only point I was trying to make was that it's possible to have a drink, even in company, and not affect anyone else in the slightest, whereas that is much harder to do when smoking. The incidents you mentioned above are down to the individual abusing the product, rather than issues with drinking anything at all. But I do agree that drunken behavior of any sort is unpleasant and often dangerous. I'm oddly in the middle on this one. I hate cigarettes but I love the liveries from the 90s and think we should all be free to decide our own actions. Tobacco ads normally influence brand choice more than whether someone smokes in the first place in my experience, so let them plow their money into sponsorships, lets have a lot more money for the little teams, and that will even up the field a fair bit I reckon. The biggest oddity is that tobacco advertisement is banned, but alcohol advertisement is ok.
Edit: The word logo is also full of the chevrons too, it's not even subtle. Ah, thanks Flash. I think it is a ridiculous claim, but if you have to tilt your head and pretend it is a cigarette pack, then it looks like it. Just like under certain low lighting and from a certain angle, Pamela Anderson looks like she's 25!